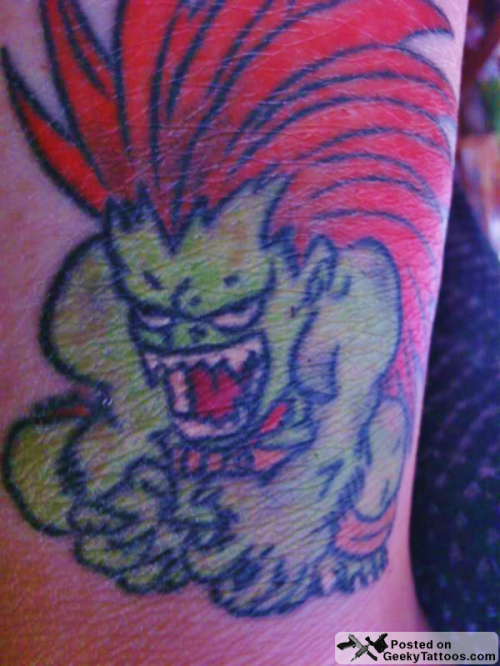 Ashley got the tattoo of Blanka because he’s her favorite character in Street Fighter. She says he’s incredibly sweet and her heart breaks every time she sees his back story in Super Street Fighter IV. Something about his mother and him wanting people to accept him. I dunno. All I remember is that nasty shock I get whenever I try to get close to him. Tattoo by her “husband’s friend Bob” at “his garage”. Tagged with Blanka, Street Fighter.